Glaucoma is the leading cause of irreversible blindness in the world today. It is called the silent thief due to its lack of symptoms. It is typically, but not always, caused by a build-up of fluid in the eye. With early detection and treatment, you can often protect your eyes against any serious glaucoma-related vision loss. It can only be diagnosed through regular eye exams by your eye doctor. In everyday terms, glaucoma is an elevated pressure within the eye. 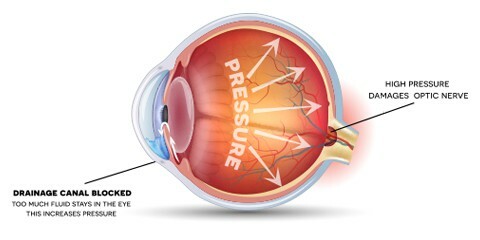 The buildup of pressure inside the eye subsequently damages the optic nerve, causing vision loss. As the millions of nerve bundles within the optic nerve are damaged, loss of vision will occur, usually in the peripheral areas of vision first. This loss of vision often goes unnoticed. Since glaucoma is typically a painless disease, early diagnosis through routine exams is critical to prevent permanent vision loss. Glaucoma is caused by a build-up of high pressure fluid inside your eye. The liquid in the front part of your eye may not circulate normally. There are mesh-like channels that can become blocked, allowing liquid to build up. The condition is commonly hereditary and, therefore, can be passed from parents to children. Early diagnosis and treatment of glaucoma may prevent loss of vision or blindness. For this reason, a glaucoma screening is recommended every 2 years for people over the age of 35 and persons with a family history of the disease are encouraged to get exams even more often. If you’re over age 40 and have a family history of glaucoma, you should receive a complete eye exam from an eye doctor every 1 to 2 years. If you have health problems such as diabetes or a family history of glaucoma or are at risk for other eye diseases, you may need to go more often. Because glaucoma’s symptoms can be hard to detect initially, it is important to visit an eye doctor for a complete glaucoma test. Visual Acuity Test This eye-chart test measures how well you see at various distances. Visual Field Test This test measures your peripheral (side) vision. It helps your eyecare professional determine if you have lost peripheral vision, which is a sign of glaucoma. Dilated Eye Exam In this exam, drops are placed in your eyes to widen, or dilate, the pupils. Your eyecare professional uses a special magnifying lens to examine your retina and optic nerve for signs of damage and other eye problems. After the exam, your close-up vision may remain blurred for several hours. Pachymetry is the measurement of the thickness of your cornea, which influences the pressure readings obtained in the office. Your eyecare professional applies a numbing drop to your eye and uses an ultrasonic wave instrument to measure the thickness of your cornea. Knowing this thickness measurement influences how aggressive the treatment plan needs to be. Nerve Fiber Analysis scans the retina and creates a detailed map of retinal nerve fiber thickness. This test can be done quickly and does not require pupil dilation. This test can aid in identifying the severity of glaucoma in a patient as well as measuring progression of glaucoma over time. There is no cure for this condition; however, eye drops and oral medication can relieve fluid pressure within the eye and slow progression of the disease. When medication is ineffective or side effects are intolerable, laser treatment can decrease pressure, seal leaky blood vessels, lessen scarring, and preserve vision.